This is sponsored advertising content by Chase. All opinions, as always, are my own. It’s evening in Dallas and the moment has arrived. Our performer, a legendary British rocker and singer-songwriter whose music has permeated our lives for decades, is stepping out onto the stage. No opening act, because who on Earth could open for him?! And there he is, as I’ve always imagined him. A sparkly lavender suit. Outlandish sunglasses. He sits down at the grand piano dwarfing the stage and plays a single chord. A G and a G with his left hand. A B and a D and an F# and a B with his right. One chord. That’s all it takes. It’s immediately obvious what song he’s about to play, the song about the electric boots and the mohair suit. It’s one of his most beloved hits and the crowd absolutely LOSES IT. There are few performers who can make a stadium scream with a single chord. I’ve never been to Dallas in my life, but I’m here for my third event for select Chase Cardmembers. If you have the British Airways Visa Signature Card from Chase, you have access to signature events throughout the year. These events are just for cardmembers and not open to the public. Earlier this year I went to a formal dinner in San Francisco with Princess Diana’s former personal chef and got to chat with him about William and Harry. Where else can you do that? Later, I went to a Spanish and Irish cultural fusion night in the single most spectacular venue I’ve ever visited in New York. Follow the link here to see a gallery of the amazing experiences cardmembers can access. And this Dallas experience was a concert — bit so much more. This performer is popular enough to sell out like crazy, but instead of just regular seats, we’re watching from a private box. It comes with all the trimmings, including tons of food and an open bar. 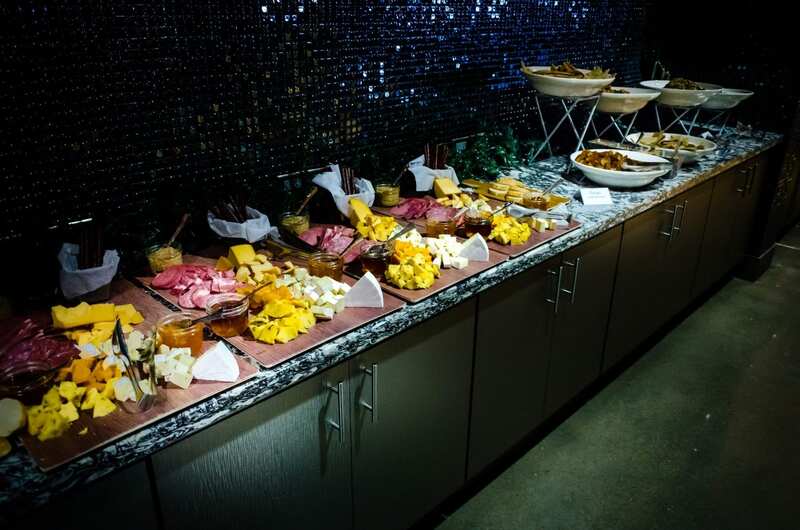 Beforehand, there’s a reception at one of Dallas’s most recognizable buildings, and the next morning there’s breakfast reception for everyone. I arrive and check into the Hyatt Regency Dallas, located in the heart of downtown. Everything really is bigger in Texas, I think to myself as I check into the behemoth of a hotel, sprawling what seems miles in every direction. A night at the hotel is included. My friend Alexa has flown down from New Hampshire to join me at the event. We primp — I opt for a hot pink jumpsuit, while Alexa goes for a black cocktail dress — and head downstairs. 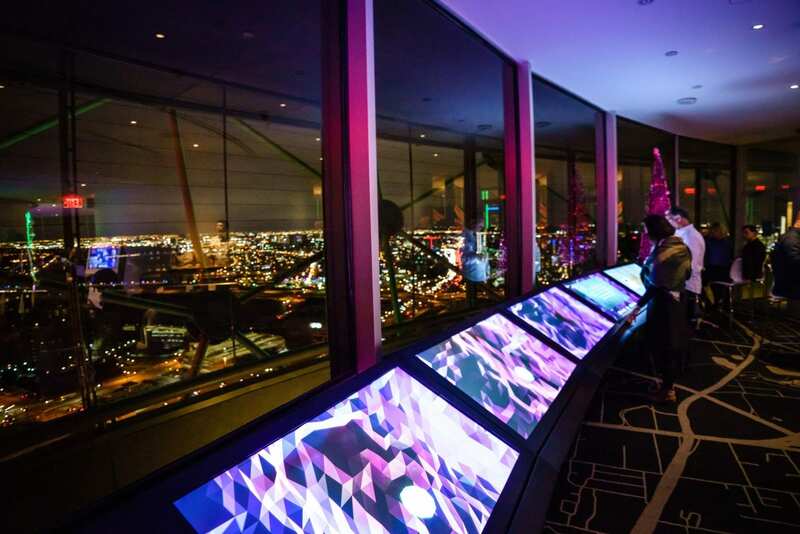 Our pre-concert reception is at the top of the Reunion Tower, which has the tallest observation deck in Texas. A giant ball studded with lights atop a skyscraper, it cuts an instantly recognizable silhouette through the Dallas skyline. It also happens to be connected to the Hyatt Regency, so we don’t need to even go outside! Everyone up here is here for the concert. 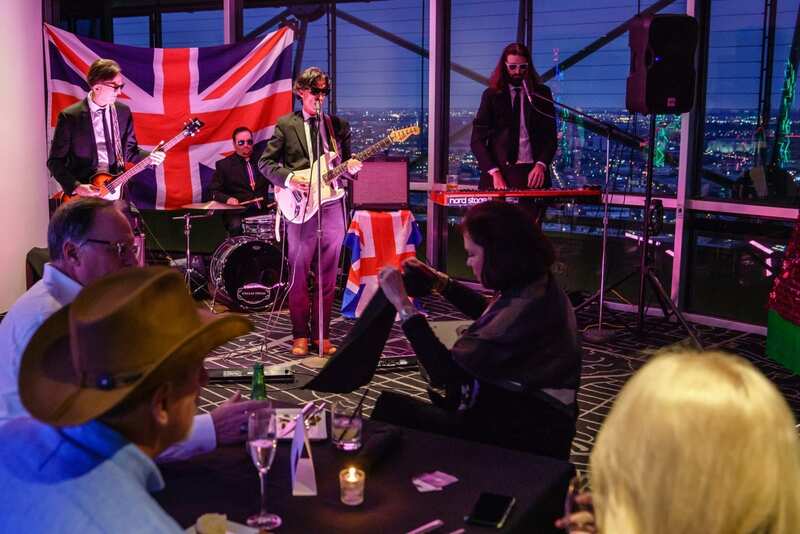 We have a live British tribute band performing everything from the Rolling Stones to the late great David Bowie (side note: anyone else still devastated that he’s gone?). Waiters with canapés are circling the room and Alexa and I toast two glasses of champagne. Listening to “Space Oddity,” enjoying appetizers, and feeling the lightness of champagne bubbles, it’s the perfect start to the evening. And even though it’s chilly and rainy, I step out onto the outside deck to take in the view. You probably noticed that I haven’t named the British singer-songwriter in question. There’s a reason for that. But I’m sure you can figure it out — after all, who else wears sparkly lavender suits with outlandish sunglasses and plays the piano? He’s a legend. His songs were the soundtrack to my life growing up — as they were for the other guests in their forties, fifties, sixties, and seventies. 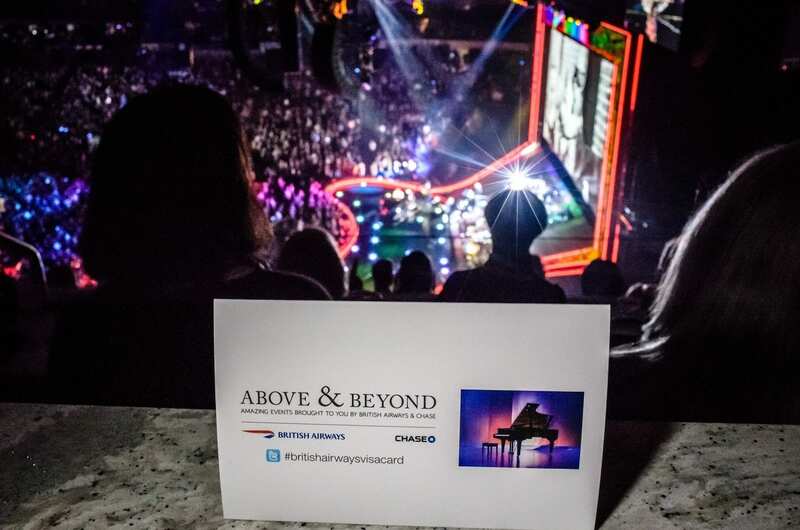 We’re experiencing the concert in the best way possible — in a private box. I’ve experienced a few private boxes over the years, and if you ever get the chance to experience one, you must. The advantages? Getting to move around as you please, an open bar (with delicious Moscow mule specialty cocktails), bathroom access away from the masses, and tons of food. You don’t have to worry about tall people blocking your view, or being squished together with the drunken masses. This is how celebrities get to experience concerts and it’s amazing. This is perhaps the best way possible to experience a legendary performer. And did he ever come to play. There was the opening song that I thought was named after the gangs from West Side Story, the one that I swear Frank Ocean used as inspiration for his song “Super Rich Kids” 40 years later. There was the song that Ewan McGregor sang to Nicole Kidman in Moulin Rouge!, a song that I became smitten with as a 17-year-old and went on to perform at a coffeehouse in high school. And of course, the song that always reminds me of the episode of Friends when Phoebe gets the lyrics wrong and thinks he’s singing to Tony Danza. This is the last round of touring for him. (Well, so he says right now. You never know.) In between the songs, he talks about the most meaningful moments in his life. How he would write songs together with his songwriting partner of decades, his partner first writing the lyrics, then how he wrote the perfect music for them. How he found sobriety, and how it saved him from dying at an early age like many of his musical peers. How he found meaning in building a foundation to fight HIV/AIDS, and how much of his activism stemmed from guilt for not doing more during the apex of the crisis. And the joy he found in finding his family — falling in love with his husband, then becoming a father to two little boys. The next morning I wake up for one final experience. Alexa, who keeps the hours of a vampire, elects to sleep until fifteen minutes before checkout, while I head downstairs for one final breakfast with the crew. I grab a table with an affable couple, her from England and him from Texas, and we talk about our shared love for Boston. Once again, I marvel at how so many interesting people come to these events. We enjoy our omelets as a musician plays the guitar, singing more British hits of the sixties and seventies. I loved this event. I love that I got to see this performer once in my life, on his final tour, and that I did so in the best way possible, with the private box, the pre-concert reception, and so much fun from beginning to end. I may not go to a ton of concerts, but this was easily the best concert experience of my life. This is just one of many exclusive experiences available to you with the British Airways Visa Signature Card from Chase. 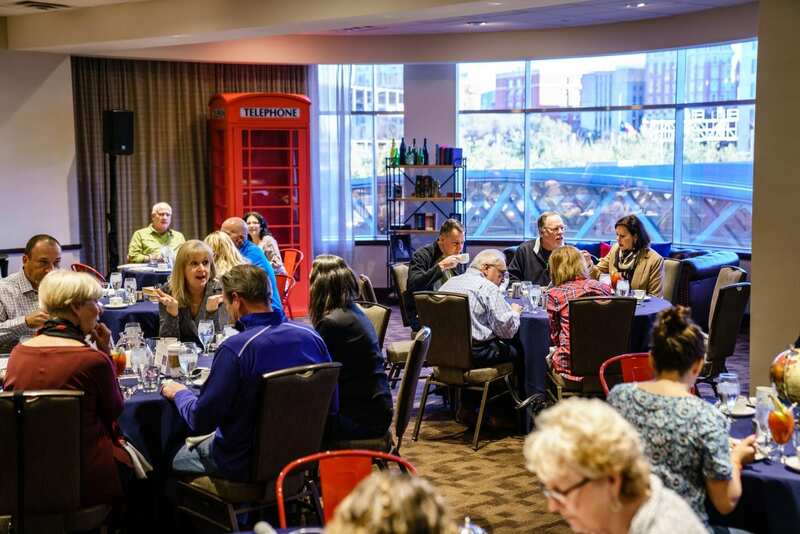 These are unusual and special events that money can’t buy — but they’re available for surprisingly good prices, just for being a cardmember. know about William and Harry! You can’t put a price tag on that. There are lots more Chase British Airways Visa events on the docket for 2019. In March, there will be a Chicago event for St. Patrick’s Day where you can celebrate the dyeing of the Chicago River green — something I’ve always wanted to experience myself! The event includes dinners and a cooking demonstration by Irish celebrity chef Stuart O’Keeffe. Next up will be an ultimate Florida golf experience in Sawgrass, Florida, including two full rounds at iconic courses. I’m a longtime user of the British Airways Visa Signature Card from Chase. I first started using it in my early days of travel, just after getting home from my first six-month trip to Southeast Asia, and I loved accumulating Avios, British Airways’s points system. I quickly accumulated a big Avios bonus but instead of blowing them all on a first class flight to Asia, I used them little by little for dozens of economy flights all over Europe. When I was based in the UK, I could get flights within Europe for as little as 4,500 Avios each way — so I used a TON of them, just from my regular purchases! You can sign up here for the British Airways Visa Signature Card from Chase. What was the best concert of your life? Share away!